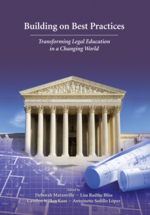 This book addresses law school missions, creating a balanced curriculum, and pathways, integration, and sequencing the curriculum. It provides a comprehensive analysis of experiential education and all its forms, including law clinics, externships, and alternative clinical models. The book provides a broader view of what legal education must do to train lawyers of the future, and identifies ten essential areas of legal education, together with guidance on what and how to teach them. Finally, the book identifies how to create an institutional culture of assessment in law schools, and how to transform legal education in today’s world.